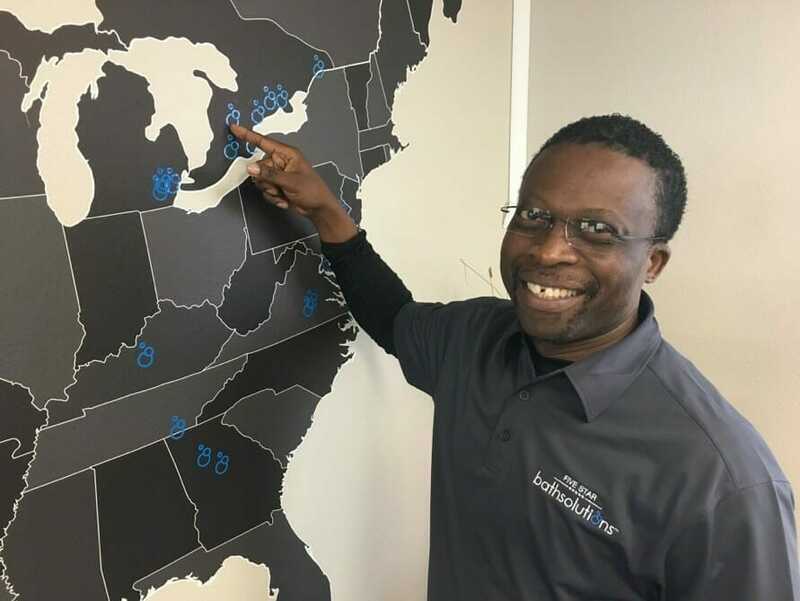 Nigerian native Baba Afolabi has recently opened a bathroom remodeling franchise with Five Star Bath Solutions in the Ontario Canada area- Brampton and Mississauga. Baba has been ambitiously working and living in Ontario for several years as a system specialist in the financial services industry. Hoping to pursue self-employment to attain control and autonomy for himself, he had been investigating and researching franchising for a number of years and felt that with a recent job transition in March of 2018, the time was right to achieve his financial and career goals with Five Star Bath Solutions. What first attracted Baba to the home improvement space was the opportunity for growth, expansion, and connection. Says Baba, “I enjoy spending time out in the community creating awareness for my business. Attending several networking events on a monthly basis such as the chamber of commerce, trade shows, industry organization events where potential customers and strategic referral partners network.” Having a flare for renovation and remodeling, Baba was drawn to the robust and well-designed system Five Star Bath Solution offers its franchisees. Having had negative experiences in the home improvement space himself, Baba’s goal is to provide his customers with the bathroom they want and to put a smile on their face. Baba is married to his wife, Olayinka, a self-employed Project Manager, and they have three children. Five Star Bath Solutions provides him the ability to spend time with his family and on his personal hobbies. We are excited to see what is in store for Baba and the new adventures that await him with Five Star Bath Solutions.